Pregnancy in the interstitial part of a fallopian tube is a rare and life threatening obstetric emergency. It is associated with uterine rupture and significantly high maternal morbidity. We present a case of ruptured first trimester interstitial ectopic pregnancy which was sealed off by bowel, thus preventing hemorrhage. The case was managed laparoscopically, excising a thin portion of myometrium along with the ectopic mass, followed by cornual repair. Interstitial pregnancy is defined as implantation of embryo in interstitium, the proximal most part of fallopian tube. It is a rare entity with poor prognosis if not diagnosed and treated in a timely manner. Ectopic pregnancy has an incidence of 11 per 1000 pregnancies. Interstitial pregnancy accounts for 2-4 % of all cases but 20 % of ectopic related mortality. This is explained by high rates of rupture and hemorrhage. Risk factors are similar to tubal ectopic pregnancy, including PID, use of intrauterine device, Mullerian anomalies, use of ART and previous pelvic surgery. Ipsilateral salpingectomy is a unique risk factor exclusive to interstitial ectopic. Interstitial pregnancy is usually diagnosed between 6 to 10 weeks. A combination of history, examination and investigations aids an early detection. Transvaginal ultrasound, serial β human chorionic gonadotropin and progesterone measurements help in accurate diagnosis. Several modalities are available for the management of interstitial ectopic (observation, medical management, hysteroscopy guided suction, cornual wedge resection and hysterectomy). In addition, laparoscopy is a safe and effective method. It is not contraindicated even in cases with rupture. A 30 year old woman presented with 2 months amenorrhea, positive pregnancy test and pain in abdomen. She had no bleeding or syncopal attacks. She had undergone cesarean delivery 2 years back and the current pregnancy was a spontaneous conception. She had no history of pelvic inflammatory disease, intrauterine contraceptive device use or pelvic surgery. On examination, pulse and blood pressure were normal. There was no abdominal distension, but there was tenderness in right iliac fossa. Vaginal examination revealed a bulky uterus with ill-defined fullness in left fornix. Ultrasound showed empty uterine cavity and a heterogenous mass adjoining the uterus, partially surrounded by myometrium. Both ovaries were seen separately and there was no hemoperitoneum. Hemoglobin was 9.8 gm % and other investigations were within normal limits. She was taken for laparoscopic resection of ectopic mass with salpingectomy for a provisional diagnosis of tubal ectopic pregnancy. Peritoneal access was gained by supraumbilical port and 2 lateral ports. Uterus was bulky with normal fallopian tubes and ovary on left side. Omentum and large bowel were adherent to right cornua, fallopian tube and ovary were not visualized. Dissection revealed a ruptured interstitial ectopic sealed off by omentum and bowel. Conceptus was removed and sent for histopathological examination, which confirmed the diagnosis (Figure 1). Surrounding myometrium was infiltrated with diluted vasopressin, and a small portion was excised. Right salpingectomy was done. The myometrium was repaired with interrupted sutures with vicryl 1. (figure 2) She had an uneventful post-operative recovery. Figure 1. Intra-operative view showing site of rupture and extruded conceptus after separation of adhesions. Figure 2. Right salpingectomy and myometrial repair was done. Non-tubal ectopic pregnancies account for only 10 % of all ectopic pregnancies but contribute majorly to morbidity and mortality. Interstitial pregnancy itself is very rare, roughly 2 % of all ectopic pregnancies. However, it has a higher contribution to mortality due to increased risk of rupture in highly vascularized myometrium. Our patient likely had a small sized rupture with slow hemorrhage, which resulted in its sealing off by omentum before significant bleeding could occur. Diagnosis is usually made by a transvaginal ultrasound, which is an important investigation in such cases. It is based on ultrasound criteria set by Bourdel. a. Gestational sac (GS) placed eccentrically with respect to the uterine sagittal axis. b. Absence of double decidual sac sign around the GS. c. Myometrial layer less than 5 mm around the GS. In cases where TVS is inconclusive, MRI may be done for confirmation. In our patient, diagnosis of tubal ectopic was made on ultrasound and MRI was not done. Several modalities of treatment have been studied for interstitial pregnancy. The management should be tailored according to individual patients. Our patient was symptomatic, hence a surgical procedure was done for her. The management of an interstitial ectopic pregnancy parallels that of other tubal ectopic pregnancies, in general. A study by Hunt et al from showed 87% success rate with single or multi-dose methotrexate in non-tubal ectopic. Case reports by Macaes and Sanchez Contreras also demonstrate safety of local Methotrexate injection. [10,11] Laparoscopy may be undertaken as primary method of treatment in pregnancy of unknown location, when patient desires sterilization surgery or when patient has acute abdomen. It is also used as secondary treatment in failure of medical therapy. Myometrium may be repaired by double purse string, figure of eight or interrupted sutures. Laparotomy and cornual wedge resection was earlier used as first choice surgery, however, it is rarely required now due to superior visualization by endoscopy. In unruptured interstitial pregnancy, hysteroscopic visualization of gestational sac followed by suction and evacuation under ultrasound or laparoscopic guidance can be considered. There is risk of uterine rupture and hemorrhage in this procedure and need for conversion to laparoscopy or laparotomy must be discussed with the patient. Interstitial pregnancy is a rare obstetric emergency. Transvaginal ultrasound is a crucial tool in early diagnosis. Management should be tailored as per individual case. In unruptured interstitial pregnancy in a stable patient, laparoscopy can be a safe and effective technique. Kahramanoglu I, Mammadov Z, Turan H, Urer A, Tuten A. Management options for interstitial ectopic pregnancies: A case series. Pak J Med Sci. 2017 33(2): 476–482. Brennan DF. Ectopic Pregnancy-Part I: Clinical and Laboratory Diagnosis. Acad Emerg Med 1995; 2(12):1081–9. Simpson J, Alford C, Miller A. Interstitial pregnancy following homolateral salpingectomy. Am J Obstet Gynaecol. 1961;(82):1173–9. Murray H, Baakdah H, Bardell T, Tulandi T. Diagnosis and treatment of ectopic pregnancy. Canad Med Assoc J. 2005; 173(8):905-12. Grimbizis GF, Tsalikis T, Mikos T, Zepiridis L, Athanasiadis A, Tarlatzis BC, et al. 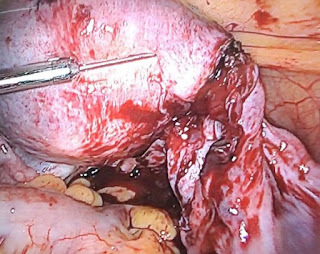 Case report: laparoscopic treatment of a ruptured interstitial pregnancy. Reprod Biomed Online. 2004; 9(4):447–51. Surbone A, Cottier O, Vial Y, Francini K, Hohlfeld P, Achtari C. Interstitial pregnancies’ diagnosis and management: an eleven cases series. Swiss Med Wkly. 2013; 143: w13736. Bourdel N, Roman H, Gallot D, Lenglet Y, Dieu V, Juillard D, et al. Interstitial Pregnancy. Ultrasonographic diagnosis and contribution of MRI. A case report. Gynecol Obstet Fertil. 2007; 35(2):121–4. Hunt SP, Talmor A, Vollenhoven B. Management of non-tubal ectopic pregnancies at a large tertiary hospital. Reprod Biomed Online. 2016; 33(1):79–84. Sanchez CJ, Hernandez VLE, Villalobos CMA, Risco CRJ. 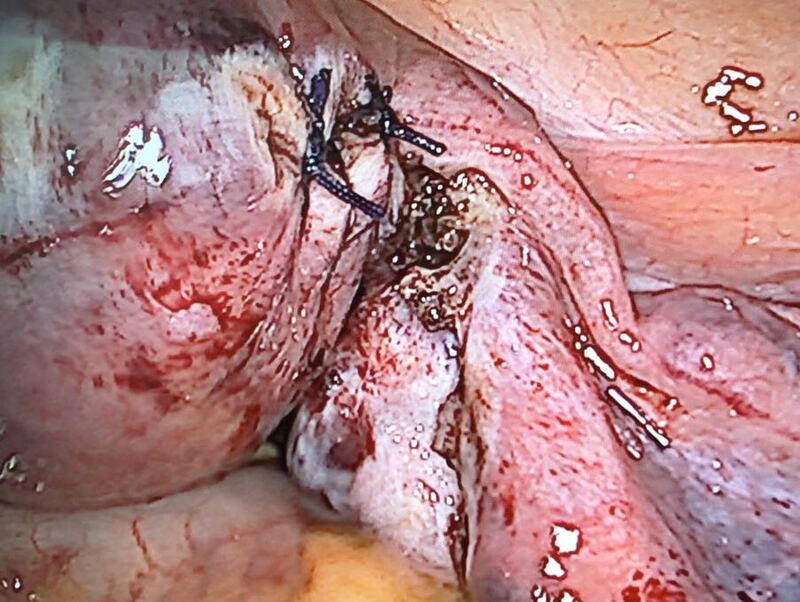 Conservative treatment of interstitial ectopic pregnancy and endometriosis with laparoscopic methotrexate and potassium chloride and complementary management with nasal nafarelin. Report of a case and review of the literature. Ginecol Obstet Mex. 2000; 68:35–8. Guan J, Yu X. Laparoscopic Double Purse-String Suture Technique and Its Fertility Outcome in Interstitial Pregnancy: A Review of 15 Cases. J Minim Invasive Gynecol. 2015; 22(6S): S144.